"There's no relative direction in the vastness of space," a Starfleet high mucky-muck tells Enterprise Captain James T. Kirk (Chris Pine) in "Star Trek Beyond." "There's only you." She's asking him whether he wants to give up his captain's seat for a chance at a powerful desk job on the eve of his thirtieth birthday, a year younger than his father was when he died. Her language is meant to spur Kirk to look inward, and for a moment we might hope that he will, and that the film will look inward with him. There's a precedent for this sort of thing. Where all of the TV incarnations of "Star Trek" were mainly about morality and philosophy, with characterization serving as a means of examining those dramatic values, most of the big-screen film versions, including the '80s and '90s versions of the flagship TV show, were mainly concerned with the heroes' personalities. The screenplays gave us detailed examinations of, say, the relationship between Kirk and his half-Vulcan first officer Mr. Spock, between Kirk and the United Federation of Planets, between Kirk and the Klingons who tormented his civilization and killed his only son, and between all the characters (Kirk especially) and the prospect of aging and death. It was more soap opera than space opera at times, but always fun to watch, sometimes moving. What undermines "Star Trek Beyond" is that it's ultimately not interested in taking a long look at the "you" of Kirk, Spock (Zachary Quinto), ship's doctor "Bones" McCoy (Karl Urban), communications officer Uhura (Zoe Saldana), and the rest of the NCC-1701 crew. Sure, it nods in that direction. Even the worst "Star Trek" stories do. But in the end it's mostly a good big-budget sci-fi action movie that's been marinated in "Star Trek" flavor packets—and thus not terribly different from the 2009 "Star Trek" reboot or its sequel, "Star Trek Into Darkness." "Star Trek Beyond" pits the crew of the Enterprise against another bellowing megalomaniac (Idris Elba) who wants to punish the United Federation of Planets for its perceived sins. It's the best of the new "Trek" films, but it's still an unsatisfying effort if you want "Star Trek" to be something more than a military-minded outer space action flick, with familiar, beloved characters shoehorned into a standard mix of martial arts slugfests, close-quarters firefights, and scenes of starships and cities being shredded and burned. Advance publicity hyped "Star Trek Beyond" as a return to the original series' roots as a showcase for a bunch of eccentric personalities traveling the galaxy, ingeniously solving problems, and indulging in populist philosophizing about civilization and the frontier as they went along. But that's not what we get here—not really. Yes, there's a promising setup (the Enterprise crew is held hostage by a vicious bad guy who rules a backwater planet a la Kurtz in "Heart of Darkness"). And there are suggestions of classic "Star Trek" style action-plus-characterization-plus-cleverness, and pleasing performances by a cast that has settled into each others' rhythms, as a real-world naval crew would after years of sailing together. But the movie never delivers on its considerable promise because it's always in such a hurry to get to the next action scene. And aside from three magnificent setpieces—the first, crippling sneak attack by a fleet of tiny ships that swarm the Enterprise like explosive bees, and two vertigo-inducing chase-and-fight scenes in which geography goes all M.C. Escher on us—the action is not good enough to be the film's main course. Lin, who proved in the "Fast and Furious" series that he could do great or near-great action, here substitutes wobbly camerawork, chop-chop editing and rumbling sound effects for suspense and a sense of spatial design. It's a step up from the action in J.J. Abrams' "Star Trek" movies, but that's not the sort of thing one should brag about. A climactic reprise of a certain overused Beastie Boys song might be the franchise's low point, rivaled only by the laughable credits sequence of "Star Trek V," which cut from a helicopter shot of a lean young stuntman scaling a craggy peak in the Pyrenees to a close-up of the 57-year-old star/director Shatner's meaty hand in a studio, gripping a fiberglas "rock." Simon Pegg and Doug Jung's screenplay provides the right amount of homage (as when Kirk grumbles after an opening action scene that he ripped his shirt again), plus Spock/McCoy odd-couple banter and some marvelous, character-based laugh lines (Scotty demands that Kirk give an opinion on one of his engineering improvisations, because "if I mess it up, I don't want it to be just my fault"). There's psychological nuance, irony, even a political subtext (Elba's character, Krall, a reptilian Che Guevara-type who wants the galaxy's "frontier" to "push back" against the Federation's expansionism). Too bad none of these aspects are filled out with the detail they deserve. 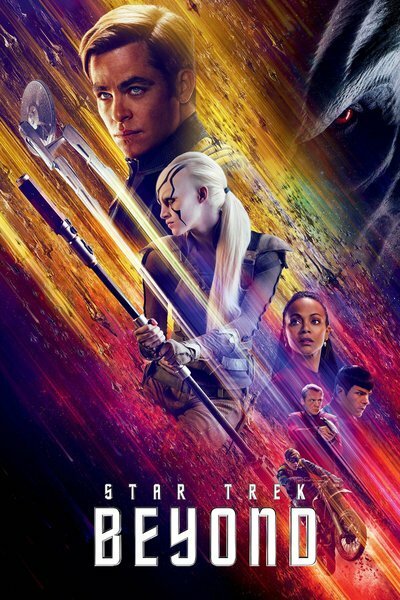 Krail's fire-and-brimstone sermonizing is turned to nonsense by a pointless and self-defeating third act "twist"—like we need another one of those after the boneheaded fan service of "Darkness"!—and there are points late in the film where "Star Trek Beyond" seems jolted by the sudden remembrance of things that it told us it was going to deal with but didn't. Uhura spends most of the movie in a prison camp. Kirk, Spock and even McCoy have human moments, but they spend too much of their screen time sprinting through hallways, firing phaser pistols, and piloting spaceships while yelling and grimacing in tight closeup, like the heroes of every other science fiction-flavored action movie projected in theaters recently. Krall and other characters allude to the Federation's fake-benevolent brand of imperialism, but unless you're familiar with examples from elsewhere in the "Star Trek" universe or got briefed by a super-fan before buying a ticket, you'll leave with no sense of whether the villains' grievances are legitimate, much less if you're supposed to feel mixed emotions at Kirk's inevitable triumph. Spock, whose home planet was destroyed by a renegade Romulan warlord in the first movie, suffers most from the filmmakers' preoccupation with pew-pew-pew! action-adventure. For three movies now, Spock's been carrying a crushing load of survivor's guilt. The character's barely disguised Jewishness, brilliantly articulated by the late Leonard Nimoy in the original TV and movie series, is more pronounced in the new franchise: he's been turned into a holocaust survivor, part of a fragile Vulcan diaspora haunted by genocide. But the scripts seem scared of treating Spock's predicament with the seriousness it deserves, much less daring to put it at the center of a film. Here it's treated mainly as an explanation for why Spock can't seem to keep a relationship going with Uhura. The death of Leonard Nimoy is integrated into the story by having Vulcan diplomats inform Spock of the death of Ambassador Spock, an alternate-universe incarnation of the character who dispensed advice and plot points to new Spock whenever the screenwriters painted themselves into a corner. The film's method of mourning Nimoy's Spock makes the Spockus ex machina thing worse. New Spock mourns classic Spock as if the two were dear friends who had dinner every Monday at the same Chinese restaurant. The missteps of writing and direction are more depressing when you consider the excellence of the core cast. Quinto and Saldana give the Spock-Uhura relationship and their own spotlight moments a lot more than the film gives them. Pegg is a hoot as Scotty, colorful but never hammy, though we may justifiably raise a Spock-like eyebrow at all the times that the actor-screenwriter lets his character save the day. Pine's Kirk seems to be morphing seamlessly into Shatner's, complete with surprising pauses and intonations, but he's more credible as a strong, respected leader; watch how the actor grows more calm and friendly whenever Kirk's bridge crew is becoming more agitated. Elba is such a strong presence throughout, even near the end, that it's a shame Krall is never granted the depth and complexity that his character keeps threatening to disclose. At this point it's worth asking what, if anything, this franchise is good for besides generating cash for Paramount and its above-the-line talent. Everything that made the original TV series and its follow-ups, small- and big-screen, seem so open-hearted, intelligent and playful is marginalized to make room for hyperactively edited action scenes and displays of hardware and production design. These are technically state-of-the-art but ultimately not all that different from what you see in most other CGI-driven action pictures, superhero as well as sci-fi—long, loud spectacles that are filled with people fighting, blowing up cities and planets, and crashing things into other things, instead of finding some other, more surprising way to move the plot along. What's the point of giving up pleasures that the "Star Trek" franchise is good at providing, to make more room for pleasures that most big-budget science fiction and fantasy already give us, month after month and year after year? Why boldly go where everyone else is already going?